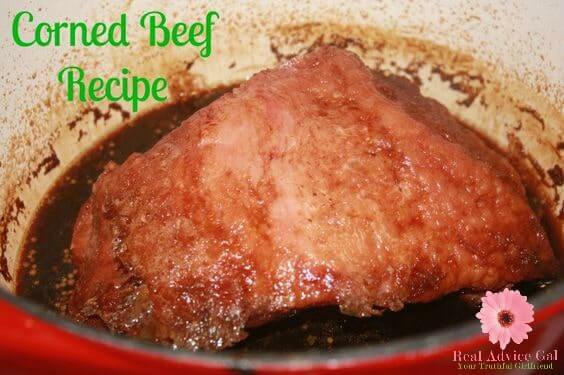 Okay so if you need an EASY Corned Beef recipe, this is your lucky day. I grabbed my dutch oven. I turned on the oven to 350 degrees you can also use a crockpot on low to cook the corned beef. They both work. I just forgot about dinner so I had to use my dutch oven. If you use the crockpot it takes about 5 hours. Once you get out the 3 ingredients, then you need to assemble them. I opened the corned beef. Then I placed it into the dutch oven. I threw one stout beer on top and 1/4 cup of brown sugar. I placed the lid on the dutch oven. Then I loaded it into the preheated oven. I cooked the meat for 2 1/2 hour. Voila brilliant meal! Check out our St. Patrick’s Day page for recipes, crafts, decors and more stuff. Corned Beef: Point Cut or Flat Cut?